NASA has developed and maintains an incredibly wide array of free data and tools, many of which will be useful to the health and air quality communities. We’ve gathered below brief descriptions, links, and, in some cases, tutorials for the ones that we think will be of most interest to the HAQAST community. This page is intended to help you get started. 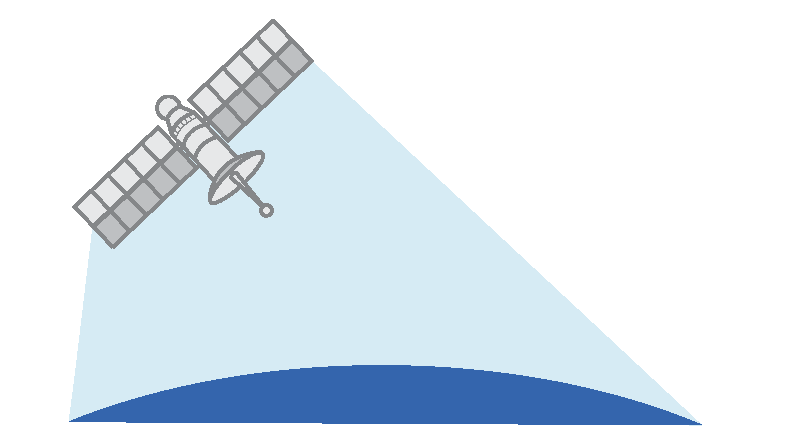 For more advanced training, consider attending NASA’s Applied Remote Sensing Training program. to flexible . In general, the more flexible a tool the more complex it is, and vice versa. 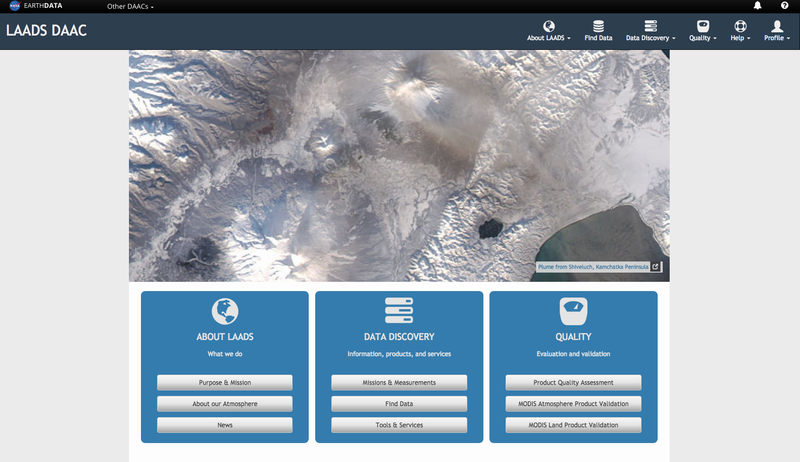 NASA provides downloadable satellite data to the public for free. For a primer on how to access and download the data, see the Download Data page. For other, more general resources that may be of interest, please visit our links page. 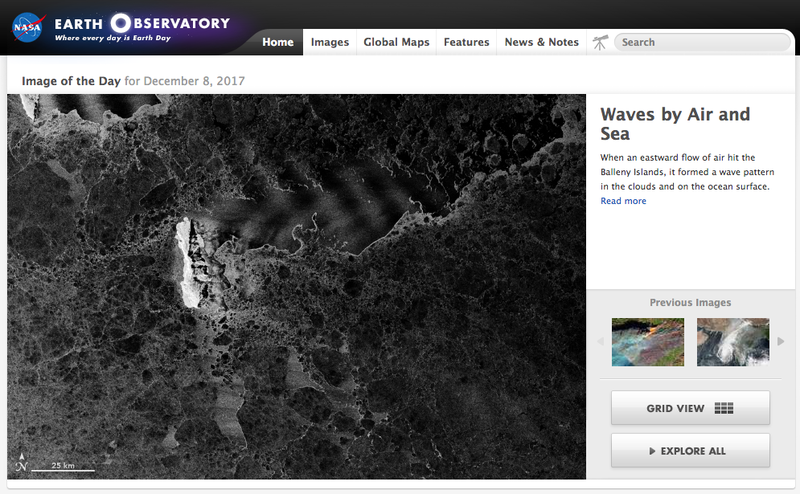 NASA Worldview is the best starting point for users new to satellite data and is freely available online. Worldview provides the capability to interactively browse global, full-resolution satellite imagery and then download the underlying data. Most of the 400+ available products are updated within three hours of observation, essentially showing the entire Earth as it looks “right now.” This supports time-critical application areas such as wildfire management, air quality measurements, and flood monitoring. View current natural hazards and events using the Events tab which reveals a list of natural events, including wildfires, tropical storms, and volcanic eruptions. Animate the imagery over time. Arctic and Antarctic views of several products are also available for a “full globe” perspective. Worldview and Giovanni together will answer the basic needs for most HAQAST applications. You can view a NASA webinar here, and a short video tutorial here, created by the HAQAST Communications Team. And here’s a written tutorial (you can find a downloadable pdf here). Earth Observatory specializes in extremely high quality photographs, graphs, charts, and other visual material focused on planet earth. 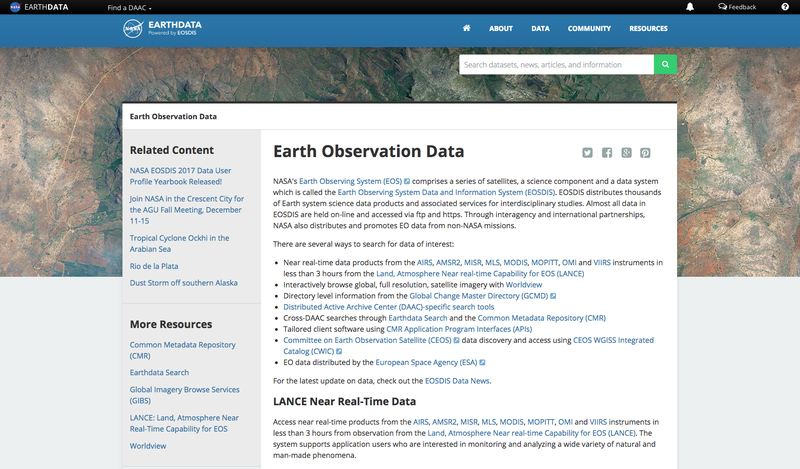 Well known for the Image of the Day, Earth Observatory also provides animated and static global maps, as well as high-quality datasets. NASA’s Fire Information for Resource Management System (FIRMS) distributes Near Real-Time (NRT) active fire data within 3 hours of satellite overpass from both the Moderate Resolution Imaging Spectroradiometer (MODIS) and the Visible Infrared Imaging Radiometer Suite (VIIRS). FIRMS includes a web-based Fire Mapper and a wide range of downloadable data, from fire maps to shapefiles. 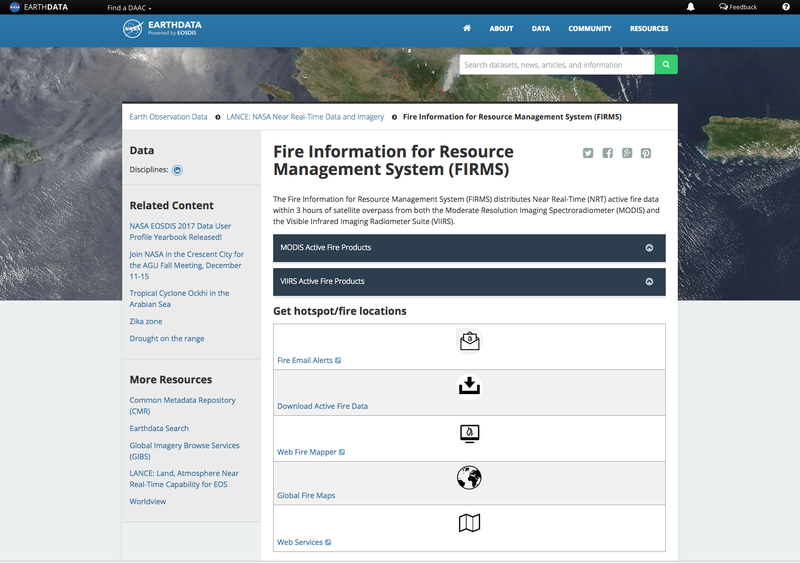 FIRMS was developed to provide near real-time active fire locations to natural resource managers that faced challenges obtaining timely satellite-derived fire information. A detailed set of FAQs can be found here. The Infusing satellite Data into Environmental Applications (IDEA) project is a collaboration between NASA, EPA, and NOAA focused on improving AQ assessment, management, and prediction. It should be of great interest to the HAQAST community. IDEA provides detailed maps of various pollutants (PM2.5, AOD, etc.) over the continental US from different satellites. Detailed tutorials for using IDEA data can be found here. A comprehensive website dedicated to all things NO2. 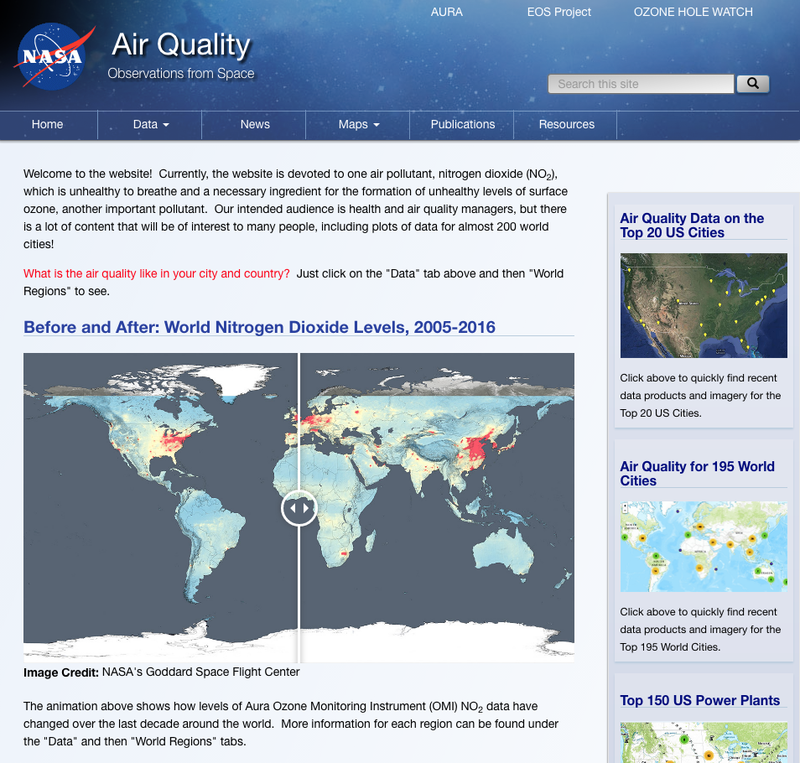 You’ll be able to download maps and images, browse through free data and visualization resources, download various publications on NO2 modeling, and sample a wide variety of NASA’s air-quality media. This is a great general resource intended for health and air quality managers as well as others who are looking for less-technical NASA resources. NASA makes available a great deal of data free to download. There are various ways to search for the data products that you need, and various ways to download it. This site is a comprehensive resource that should get you oriented and downloading quickly. Along with Worldview, members of the health and air quality community will find Giovanni extremely helpful. Giovanni is a web-based interface that allows users to interactively analyze gridded data online without having to download anything. It is a flexible platform that allows a user to average data over time, create a range of plot types and formats, compare variables, and graphically display information. You can also download plot source files in netCDF format. Here’s a tutorial (you can find a downloadable pdf here), and a short video tutorial here, created by the HAQAST Communications Team. AERONET is a large federation of ground-based remote-sensing networks that all focus on aerosols. 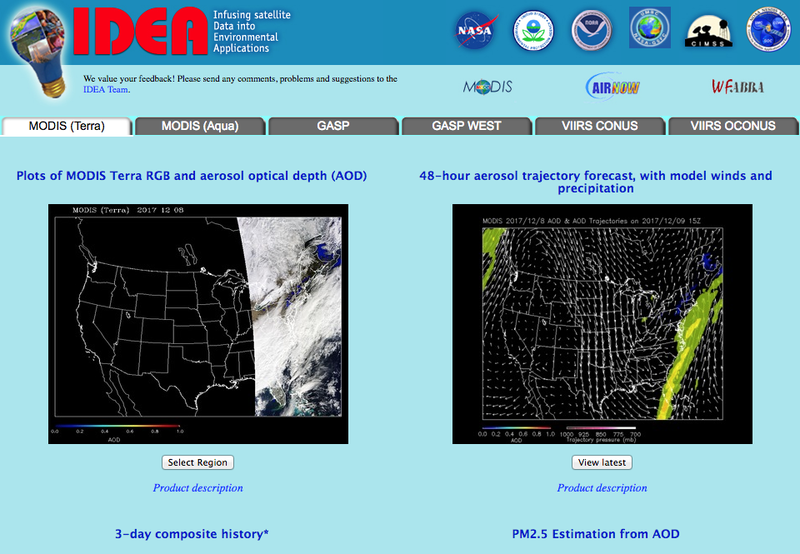 The program provides a long-term, continuous, and readily accessible public-domain database of aerosol optical, microphysical, and radiative properties. 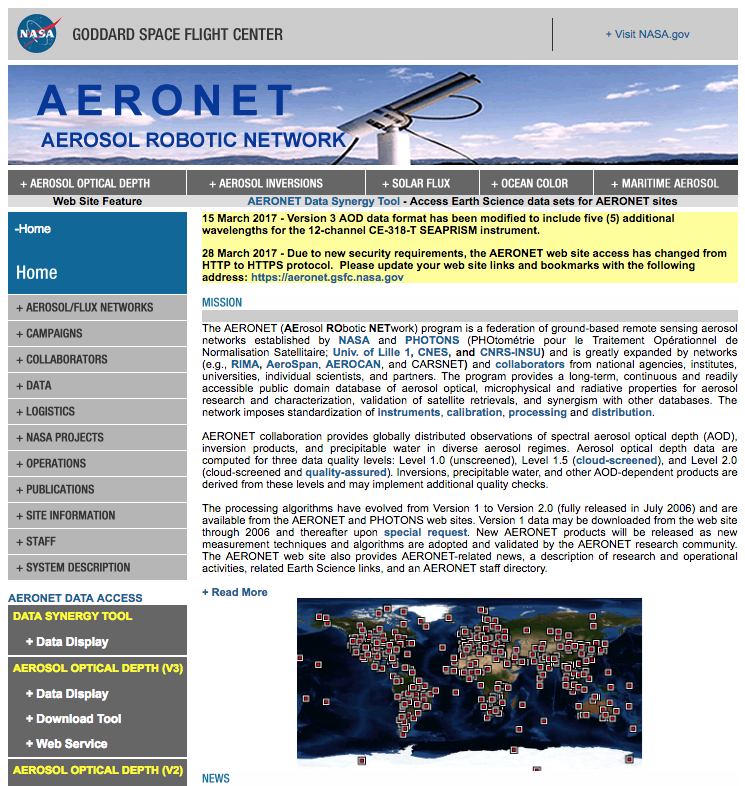 The AERONET web site provides data analysis and dissemination tools. You can also download data. Members of the AQ community will be particularly interested in Aerosol Optical Depth Data Display, the AOD Download Tool, and Data Synergy Tool. 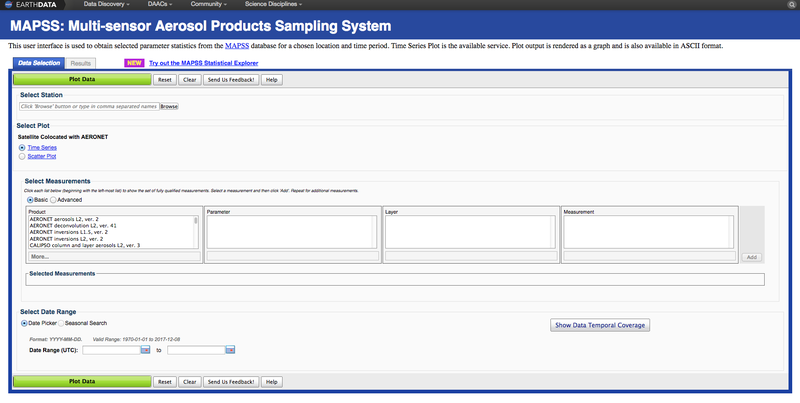 Check back soon for a Data Synergy Tool how-to. AeroStat is an online environment for the direct statistical intercomparison of global aerosol parameters in which data provenance and data quality can be readily accessed by scientists. Users can easily visualize and analyze statistical properties of atmospheric aerosol events, including data collected from multiple sensors and quality assurance (QA) properties of these data. AeroStat also provides a “Bias Adjustment” option to allow users to adjust the satellite data relative to an AERONET baseline. For more on AeroStat, click here. And for a detailed how-to, visit this site. European Space Agency’s Envisat, Medium Resolution Imaging Spectrometer (MERIS), Sentinel-3, Sea and Land Surface Temperature Radiometer (SLSTR) and Ocean and Land Colour Instrument (OLCI). The HAQAST community will be especially interested in the Atmosphere Products, the various data available for download, and the tools and services. The LAADS DAAC is an extensive site, and it’s worth spending some time exploring it. 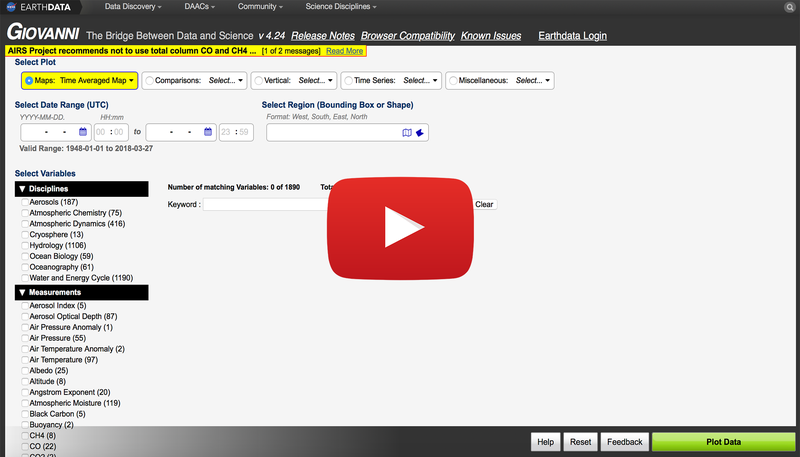 The Modern-Era Retrospective analysis for Research and Applications, Version 2 (MERRA-2) provides data beginning in 1980. 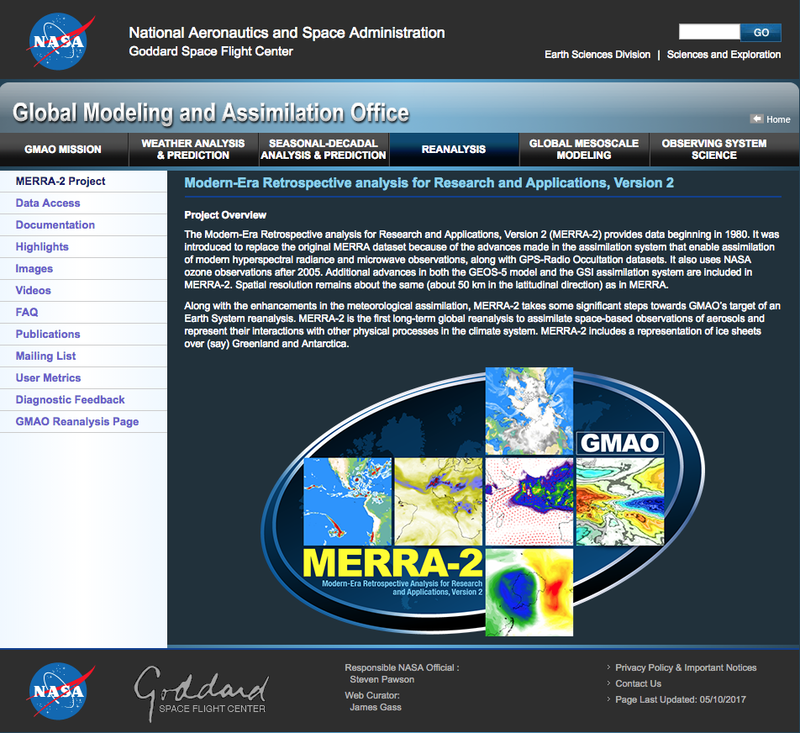 MEERA-2 is a NASA atmospheric reanalysis for the satellite era using the Goddard Earth Observing System Model, Version 5 (GEOS-5) with its Atmospheric Data Assimilation System (ADAS), version 5.12.4. 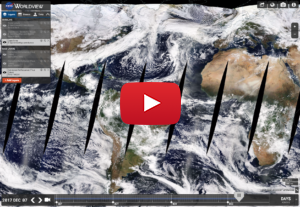 The MERRA project focuses on historical climate analyses for a broad range of weather and climate time scales and places the NASA EOS suite of observations in a climate context. MERRA-2 is the first long-term global reanalysis to assimilate space-based observations of aerosols and represent their interactions with other physical processes in the climate system. MEERA-2 data are available here; the HAQAST community may be particularly interested in the Atmospheric Chemistry data sets. A comprehensive list of datasets can be found here. NASA is in the midst of continuing to develop MEERA-2 and related tools, and more will become available in the near future. You can stay abreast of new developments by signing up for the newsletter.